Artists Jessica Spence and Dennesa Usher met while pursuing their graduate degrees in art at Lehman College. Bonding over their shared interest in portraying important societal topics like race relations and women’s issues in their work, they've stayed close friends and collaborators since. While both at different points in their careers and lives, Jessica and Dennesa reflect on how they first met, New York and how the past year politically and culturally has influenced them as individuals and artists. Jessica Spence is a New York-based artist, creating paintings that depict topics related to her life, specifically black womanhood, and societal beauty ideals. 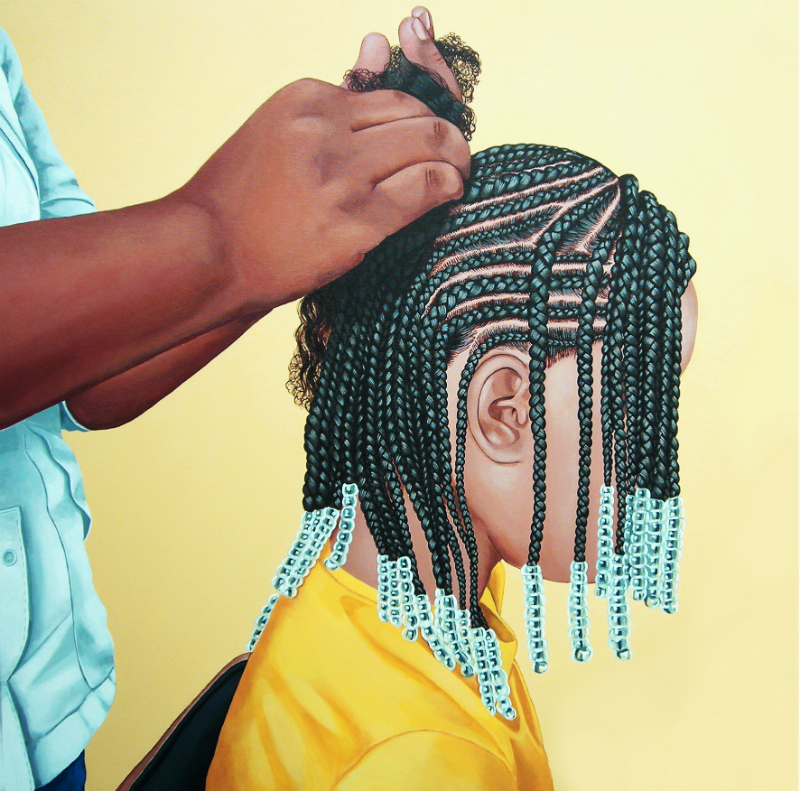 Her current body of work focuses on the beauty and versatility of Black hair. Spence has a BA in Studio Art and recently completed her MA in Art Education at Lehman College in the Bronx. Her work has been exhibited at different galleries and venues in New York. She is also an arts educator and a member of the BX200. Dennesa Usher is an American artist whose paintings and murals have been featured in Street Art NYC, Bronx 200, Bronx Artists Documentary Project (BXADP), Norwood News, News 12, Bronx Net and NBC News. Her colorful and energetic design presents a three dimensional illusion reflecting well known shapes and figures. She creates a different world than the one we know. The paintings represent the dark side of joyous experience; how new discoveries can be strange, unsettling and delightfully macabre. Her paintings are bright and colorful, monstrous and dark, dramatic and moving; a response to the world around us and it's ever changing, also never changing, atmospheres. Jessica: How did you get into painting? Dennesa: Well, the way I got into painting, was basically through school. Much like, I guess, most painters who have proper schooling. Basically, I started painting in college, although, I was exposed to painting in middle school, when I chose to be an artist, but I was mostly focused on drawing, then painting through middle school and high school. In high school, I started painting at an afterschool program run through an art center, where I would go for after school free art classes. Then I really got seriously into painting when I went to college and I started my associates degree at Hostos Community college. I started my associates degree there with Professor Ian Scott. He basically taught me how to paint, how to oil paint, and that’s when I did my first serious painting. It was of an image of a woman, and it said “Le Bronx” on it. It was really beautiful, very graphic and that’s kind of how I started painting with oils on panel. And then, I, you know, started to become very prolific and I began filling black books with pencil and ink that always went back to drawing. I started creating more drawings than paintings and it was bothering me because I could not paint as fast as I could draw. So I was pushing out all these drawings and filling out all these sketchbooks, but I couldn’t get the paintings out because they were oil paintings, they would take [too] long to dry. So what I started doing was murals. And because I had a small studio space I couldn’t do so many paintings, so I started doing murals, and I couldn’t do as many murals as I wanted again because you have to get approval for walls and what not, so I turned to gouache, and I did it on poster boards. It didn’t really fulfill me and then I started doing acrylics, acrylics on panel, and then I went to acrylics on paper. And so that’s how I found acrylics on paper. Jessica: Okay, yeah, because I can see that even working with you, when we met in class, just the scale and the format that you work, I can totally see that. For me, really I started out drawing a lot in undergrad and you know undergrad, in studio art, they have you working in multiple disciplines, just to try to find your niche and what you really like. So for me, at first, I was drawn to just drawing out things because that is where I felt comfortable. And I hadn’t really worked with oils and acrylics prior to that. So, in undergrad I took an oil painting class, as well as acrylics, and just found that the work transformed when I would use paint. And it would just bring it more to life. I felt like I could create a different mood with the colors I chose. Even still, just being able to have that control, I feel like I can create something that draws the viewer's attention with the colors I choose, rather than just using a black and white palette. And now, after doing grad school at Lehman, I love painting and it’s just something that I feel comes naturally to me. And I just feel like, I don’t know, it’s my strength. Dennesa: Okay, so let’s talk more about when we first met each other since you were talking about grad school and really finding your strength, and really settling into painting then. Let’s talk about how we met each other. Jessica: Okay well, how did we meet each other? We met each other at Lehman College. We were both doing our graduate studies, and I remember the first time we met was in our painting class with Professor McCarthy. And I remember you coming into class, you had your set-up on the wall in the painting studio, and I remember you had this confidence about you, this whole style, I was like “this girl, she’s pretty cool.” And so, I remember when we had our critiques, you always had these comments on my work which opened my eyes to things i had never heard before, and it was really helpful getting a different perspective. I’m glad that I met you because you were like a support system through all of that. Jessica: I had no idea. Dennesa: Right, and so we bonded further from that right? And I loved it, and I was like “Oh, you need to continue doing this because it’s helping me like kind of find my voice because I can look at this and kind of speak on it." And then, it turned into a friendship and now it’s like beyond school, and now it is actually in our actual lives as sisters in this thing we call “art.” I think that it kind of bloomed and blossomed into something beyond what we could have possibly thought, especially those days that you spent in my studio when you wanted me to be a subject for your work. Jessica: Yeah, I remember that. Dennesa: —And we bonded over those times when you were just trying to like better acquaint yourself with me and we just became kind of like sisters to some respect. Jessica: Yeah, I think that’s important too. That you know you have that support system. Even though we have different things about our work, we still have that commonality where it’s about us and this kind of empowerment. And like you said, that sisterhood. And so that support system, which is really important. I feel like we need more of that. Dennesa: Right, and I think that’s kind of one of the common threads in our work. It’s about having this emotion and this need, this emotional need for support from your community and basically putting your community over opportunity so that we can further one another’s lives, one another’s careers and one another’s emotional expression about what is going on around us. You know what I mean? And I think one of the other common threads that we have is not only with the mood and the emotion of the subject matter of our work, but more so the decisions about enjoying the colors, enjoying the mixing of colors and what colors kind of represent as far as our mood goes, and how it kind of extends beyond ourselves and how it captures the viewer in a way that kind of attracts them to the issues that we want to bring to the forefront. I think that within our work that is a commonality, you know, we use color to draw people to the issues that we want. Jessica: Yeah and I guess, jumping off of that, thinking about, within our own work, and those common threads, I feel like my work represents empowerment of these women. To be themselves, the individuality, because while you are seeing the beauty of this woman, you don’t know anything about this woman, but [I'm] getting you to look at this and getting you to think about her individuality, her identity, and engaging the viewer through those different forms of expression that we all possess. Maybe you could tell me a little more about, maybe some common threads or themes in your work as well. Jessica: —right, it’s very limiting in a way. Dennesa: Right, and so I feel that is very limiting. It bothers me, so it is very rare that you see that. And I do it, I’ve done it, but it’s not nearly as fulfilling. And I think that my work, if I had to say there was a theme, I would say that it would be more about the chosen and the unchosen. The emptiness and the fullness and this kind of duality between dark and light, moods and emotions, how people can be loved and unloved. There are two different sides of life in that respect that some people might not really enjoy: the unloved side of life. But it exists and so my work allows, I think, for me to express that side, as well as the other side in one. So that people who are being loved, and people who are not being loved, or people who feel empty, or people who feel full, can both enjoy my work and feel like they get something out of it you know. Jessica: Yeah, I do sense that duality that you speak of in your work. And I’m glad you touched upon that too because going into, just thinking about everything that’s going on politically and culturally within the last year alone, you know, as artists, we have our focus on what we want our work to convey, we also can’t avoid these things because we are our art. Even though I am not painting a political leader or something, or speaking on that specific topic, it still is affecting us, impacting our work, even subliminally. Jessica: So for instance, I feel like within the last year with everything that has been going on, I feel like you said that limitation and putting a label on things as what this is versus what it’s not, I feel like there’s no singular way to define a person. The political climate of the last year has reminded me that many people still view specific groups of people, may it be race religion, gender, in a stereotypical way, which as you said is very limiting and based on their preconceived notions and biases. They are very harmful and these views don’t take into consideration of the individuality as well as multifaceted dimensions of one’s identity. Even though we are from a specific group, we’re not all the same. And so, I feel like even though we are dealing with that, ironically it has caused this kind of galvanizing effect to incite different groups of people to fight against these stereotypes, bringing about action to get resolutions or ideas for more inclusion and unity which is kind of like why should we still be going over these things. It feels like we are regressing, but at the same time, due to what is going on, we need to have this dialogue and I feel like that has impacted me personally, as well as in my work. Although my artwork depicts various women, my presence is in the work and I have always chosen to use my artwork to bring a realistic representation of these women’s experiences, which we might not see depicted in the media very often. So I feel like I am giving a viewer a lens into these women’s lives, women that I know, women in my community that reject these stereotypes, especially being a woman and specifically a woman of color. I feel like this is important. Being a black woman raised in an urban environment and being a daughter of immigrants in this current social-political climate. I feel like it is very important to have these positive forms of representation and with my artwork I feel like I am able to bring these positive portrayals of their experiences, and in general I feel like what I am more interested in with my artwork is the idea of showing these women going about their daily lives and routines with no care to what others may perceive them to be. And I'd rather get the viewers intrigued to learn more about these women. Having the viewer question their own beliefs, about who these women are and why they have these limiting ideas and why these are more destructive than not. Dennesa: It seems like you take a very logical step towards expressing or defining what it is you are trying to do. For me, in the past year politically, culturally, and personally I would say the past year has influenced my work in a way that has motivated me to make it my responsibility to help others find their voice and basically spark the conversation until hopefully we are all equal. Like let’s all sit down and talk about what we’ve been doing, right or wrong, so that we can correct those things and learn about one another. And personally, you know the climate has allowed me to open up, to the other side of life, the other side of life that is often ignored or abhorred by others and has allowed me to want to speak on that truth about myself and others and take on a responsibility for my choices in my art, in my life. And basically be more aware of the people that I have touched, and the people I have motivated and inspired and how that comes into my work and how it helps me express that unheard idea of a lack of fulfillment to some extent and push a mood and an emotion that move people that are basically ignored to some extent. And if I had to say one thing about this political environment that I appreciate, although it seems to have been just very divisive... it made people come out of hiding. People who have negative ideas who were scared to come out about their negative ideas about others, have come out of hiding and... it has allowed for a dialogue and so now we all can speak on it. And then in speaking on it there are gonna be moments where we might say the wrong thing or there might be a little bit of uncomfortable moments, but lets get through it and try again... I’m not hiding anymore about how we really feel and so let’s correct it. Now we know. And like I said that would be the one take-away, I would say about this year. And so in my work it has basically allowed me to want to push my work out into the world even further and make it so that my work is not just one way of doing things and I’ve explored new avenues of bringing out my work and trying to discover new ways of pushing it out so that people who are not necessarily in the art world have an opportunity to see and have my work. Jessica: Yeah, and I think that’s important to push those narratives and create those dialogues because I feel like we need that more than ever during these times. And also like you said, getting people talking about this, we need to find a way to discuss these things and think about what can be done. I feel like even though our art is not touching on those directly, us even creating this work is creating a dialogue to get us into different entries into the discussion. Dennesa: Right. It’s a whole other language and it’s almost like being bilingual because you speak English and you speak art and so it creates a whole other dialogue. We get to discover other things about other people through the expression of art. So instead of always speaking English and only English, we speak art, we speak English... More than ever I appreciate being a multilingual person. I understand now more than ever why it’s important to have many languages and be able to understand other languages, whether it’s Spanish, or English, or art, and art and expression or poetry and painting, it all kind of helps you. The more languages that you know gets you to understand your community better, because you can hear others. And my community, which is basically New York City, that is where I was born and where I was brought up, has influenced me a lot and so I speak New York, like I literally speak New York. Jessica: What do you mean "speak New York"? Dennesa: ...Wherever I go... people who are not from New York will say something like “Oh well, you are a real New Yorker.” And I laugh, you know what I mean, because I was raised here and I was always the Bronx girl in Manhattan and I was always the Manhattan girl in the Bronx and I always was someone who was trying to encompass all things New York... There are many ways that New York has inspired my work, and it doesn’t always connect to my upbringing. but in a lot of ways it does, from hip hop to rap, graffiti, film, to technology from cassettes to CDs. I was brought up in New York, a place that almost seems to have everything first. And New York is this kind of place where things begin here and we get it first, we set the trends and then of course it goes out into the world, right? My work reflects both dark and light moods and emotions that are both ethereal and tangible. New York has made me into this expressionist artist because as you know, New York is this very dense, crowded place and everyone is always looking for a space to express themselves. I find that painting has allowed me a space to express myself. Jessica: Yeah... I feel like that is a big advantage we have growing up in New York and living here. You just go around the corner and you meet so many different people from different countries, different backgrounds, being, like you said with the different languages. I feel like that sense of community and all the diversity and the energy of the city really impacts my work because I am able to be inspired by those around me. I may not know them personally, but just seeing them, it might give me ideas or think of something I may not have thought about before. A lot of the things I draw upon are those things, that like I said within my own life, [are] within my own personal narrative. But also drawing on narratives of those I can relate to through my art, I am telling my own story, [and] those around me. And with New York I feel like there’s just something new you see everyday and it really opens your eyes versus if I was from a smaller town or grew up in a more secluded area. I feel like that is something really important and just having friends from different backgrounds and getting them to tell me about their life is very important. And personally I feel like it informs my work even more so than just reading a book, or taking a course. I’m learning from life and my experience and that’s really what I’m trying to say in my work and I feel like New York helps me tell my story. Keep up with Jessica and Dennesa's work on their sites.